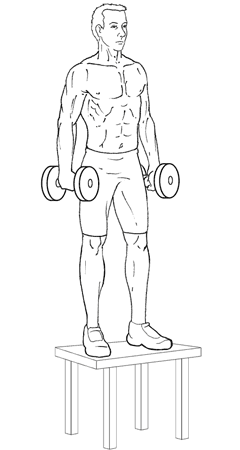 Holding dumbbells to sides, standing with legs hip-width apart, place one leg onto the bench and stand, moving other leg onto the bench. Step down with second leg first and then repeat with opposite leg. Keep a slight arch in the lower back, otherwise the back is straight and stationary throughout the movement. It’s easy to want to curl the back forward as you step up – DON’T DO THIS. Keep the shoulders back and keep the head up and looking forward throughout the exercise. Let the dumbbells hang loosely to your sides. Don’t shrug them up as you step. Don’t swing them for momentum. Focus on keeping the weight on the heel of the working leg, driving the heel into the bench before allowing the rest of the foot to balance out the weight as you stand. Your knees should always follow the direction of your toes. The back or non-working leg should be used primarily for balance. You do not want to let it become part of the exercise by using it to push off more than necessary. If you find your non-working leg becoming tired you are using it too much and may need to lower the weight load. The higher the bench (or box or whatever – any solid object can be used) the greater the difficulty. The maximum height for the bench, however, should be no higher than your knee. Much like Lunges, the length of your step can affect the exercise’s muscle emphasis. A short step will emphasize the quads while a regular step will put more emphasis on the glutes. Dumbbell Lateral Step-Ups – The bench or benches are to your sides and you are stepping laterally. Dumbbell Step-Downs – Done with one leg at a time (typically laterally) and keeping the working leg stays on the bench throughout the set. Barbell Step-Ups – Same motion with a barbell held on the back. Machine-Based Step-Ups – Cable set-ups can allow you to perform step-ups. The best and closest alternative is the Lunge. From there you have many great options for effectively working the quadriceps. These options include Squats. Like with Lunges, Squats can be performed with dumbbells. However, a barbell can allow more weight to be used and be more advantageous to the mass gain goal.